Free expression through sculpture. I wanted to write a tirade today about how much I loathe the work of Mark Rothko but instead decided to accentuate the positive with a tip of the hat to a relatively new realm of art - hyperrealism. My first encounter with this style was at an actual art gallery in Akron, Ohio. I turned around the corner after scratching my head in front of some post-modern canvas splats into a clean white-walled gallery where I was startled at the sight of a naked giant sitting in the corner. 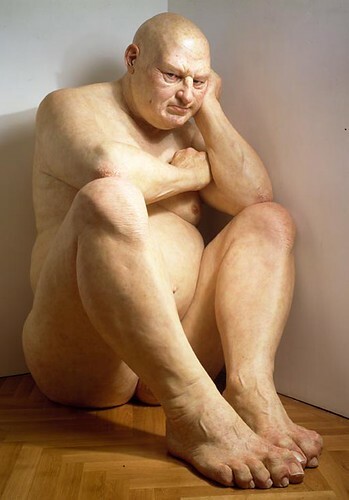 This was part of a traveling exhibit by the Australian sculptor Ron Mueck. He uses silicone and fiberglass along with paint and polyesters applied directly to cast molds of the human form. This creates an effect that surpasses reality in fooling the observer into thinking the piece has a heartbeat, bluish veins and all. By constructing the works on anomalous scales from the very large to the very small the impressive effects of these works are amplified. It was not shocking for me to learn that Mr. Mueck had worked with Jim Henson, specifically collaborating on The Labyrinth and the Story Teller series with John Hurt, as the later had a lasting impression on my imagination as a child. Trolling the web for the antithesis of Rothko I came across the works of another hyperrealist worth noting, especially considering the slant of her subject matter. Patricia Piccinini has a new exhibit at the Roslyn Oxley9 gallery in Sydney, Australia. Along with Mueck's brand of stark realism, she injects a healthy dose of organic philosophy into her sculptures. She forces the observer into an uncomfortable state while captivating attention with the painstaking detail. Her interest in the areas of bioethics and the environment show themselves to the observer through the human spirit buried within her monstrosities. Artists and artists like this seem to be ushering in an era of real post-post-modernism. Gone are the easy days of slapping some inky utensil around on a surface and asking the world to think about it. To do what these artists do a great deal of training and practice is necessary. This gives the artist's class a renewed respect as focused innovators rather than frizzled drug addicts, while still maintaining a radical voice in abstraction! 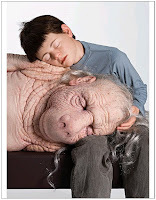 The work of Patricia Piccinini brings the philosophical/scientific ven diagram into focus. If we have the ability to do something new, should we? or would it result in something ghastly? This question was recently asked in Slate about cloning Neandretals and has been the topic of debate since the publication of Mary Shelly's Frankenstein. No one knows the answer, and if they think they do then our species should just stop thinking so hard and take our place in the geologic record. Jurassic Park was on television last week and all I could think about was how much respect I had lost for Michael Crichton when I read State of Fear. 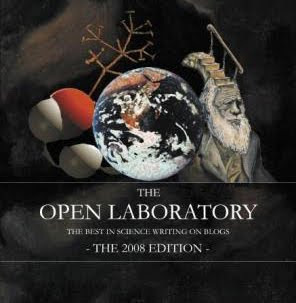 This book is a fictional account of envronmentalists/terrorists who attempt to fool the world into believing in global warming by orchestrating storms and laser induced sea level rising. I lost even more respect when I heard he met George w. Bush in 2005 to council him on the "greatest hoax ever perpetrated on the American people." When Jurassic Park came out in theaters I was too young to appreciate reading and I ate that movie up, every bit of it. The animatronics, the acting, the story, I loved it all. What I was not aware of was the ripples of philosophical fear a story like this would send through the consciousness of the general populous. "Scientists will destroy humanity with their insatiable fervor and lust for power and control over god's creation!" Michael Crichton may be in Mensa but he knows not what he does. He erodes the promise of the enlightenment and the general consensus that the United States was founded on. The idea that improvement of the human condition is perpetually possible. 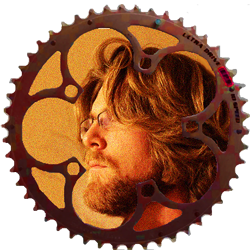 He would relegate us to a happy status quo where complacency is celebrated. A world where the scientific method is distrusted is a world where children can be denied vaccines and denied exposure to the education required for them to contribute to progress. Laws can not change the conscience of the people, but voices, keyboards, and pens can. Well argued. If Tom Paine's kind ghost has not recently communed with the spirits of Michel Foucault and Bruno Latour, we would strongly recommend, respectively, "The Order of Things: An Archaeology of the Human Sciences" and "We Have Never Been Modern."